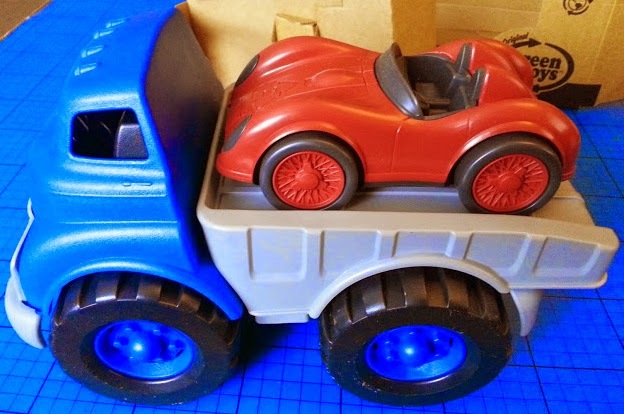 I thought maybe my boys were growing out of playing with Green Toys vehicles, except for in the bath and sand pit where they're always popular, but the Flatbed Truck & Race Car is a bit different and has caught the attention of even my 6 year old, despite being a toy suitable for 12 months and over. 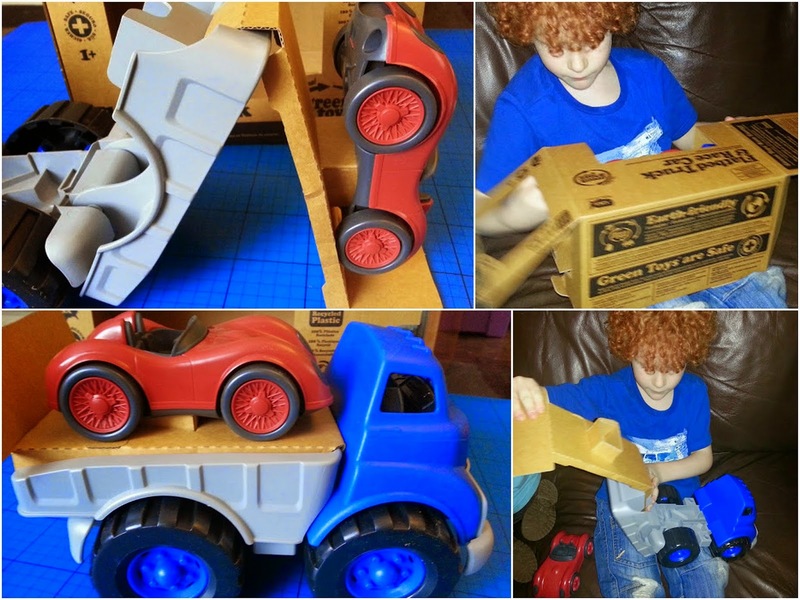 The packaging on Green Toys is as ethical as the toys themselves, made from recycled and recyclable card, and using ingenuity and design rather than wires, tape and plastic wrap to hold the toys in place. The Flatbed Truck & Race Car has some really nice detail when you get close up and look at the plastic. Aside from the mouldings, the actual feel of the Green Toys recycled plastic is lovely and tactile and almost warm - it has the same textured finish as the milk bottles it's made from. The flat bed tips to drop off the race car, but isn't heavy enough to overbalance and tip up the truck - something that really frustrates children. 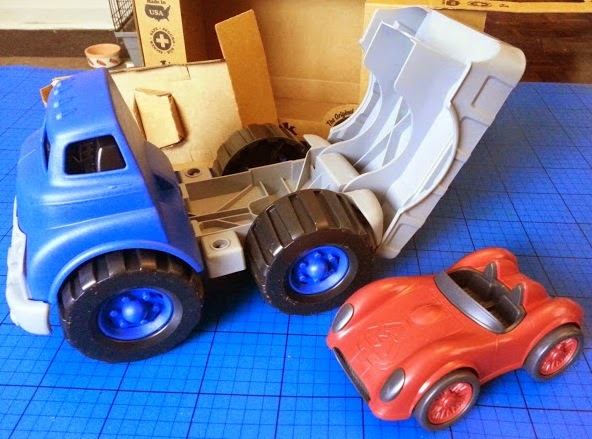 Both vehicles have moving wheels, but otherwise are static, and for older children this does limit play, but is the reason these can be suitable for children aged 12m+. 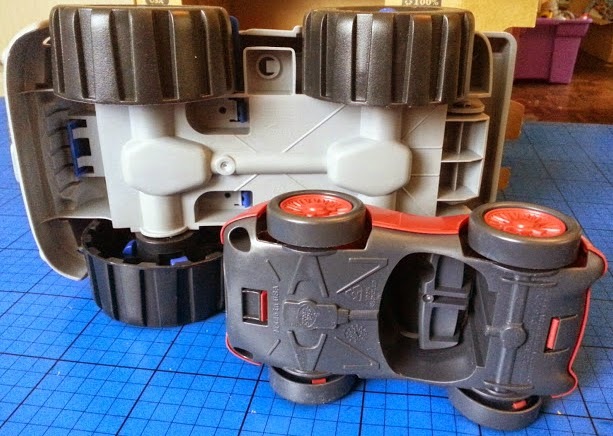 The truck and car are chunky, very strong and have no sharp corners, thin or brittle plastic. It'll take a lot of bashing and crashing. As ever this Green Toys vehicle set is made from 100% recycled plastic milk bottles and so can be submerged, left in water, and even washed in the dishwasher without coming to any harm. 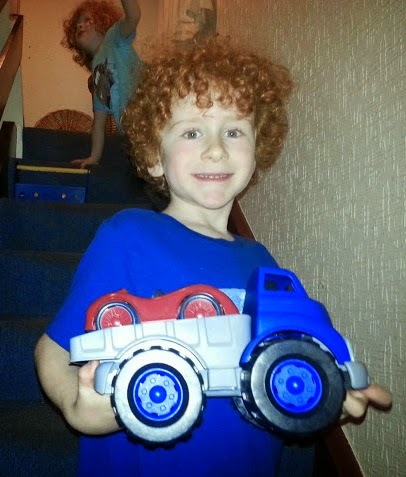 It makes it a brilliant all-around toy for the living room, bath, garden and sand pit. 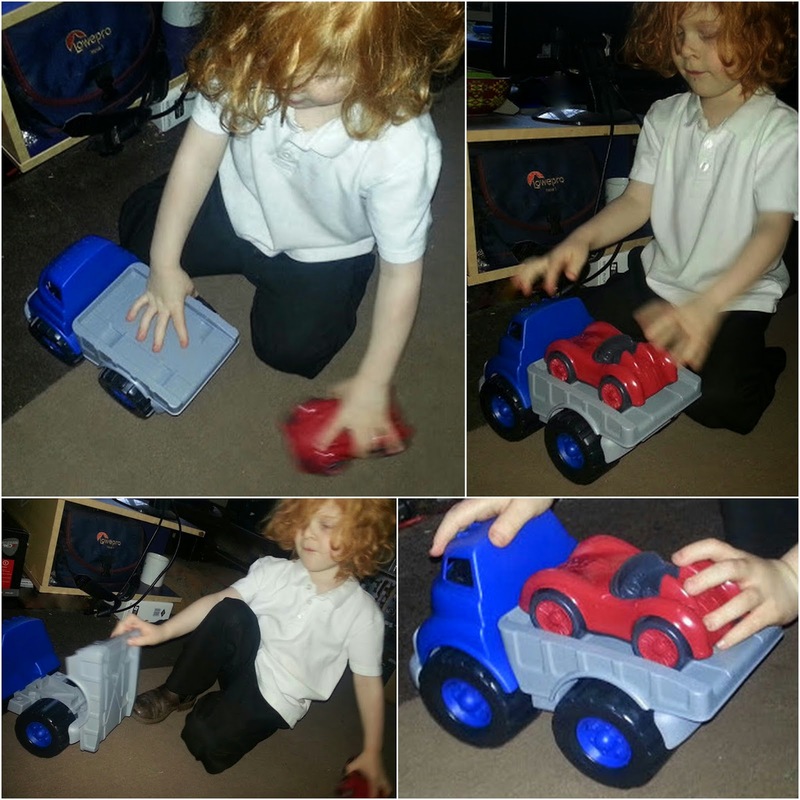 My boys are really enjoying playing with the Green Toys Flatbed Truck & Race Car despite being at the top of the age range at 6 and nearly 5. The sheer bulkiness and size (yet it's very light) and lovely feel to the recycled plastic makes it hard to put down. 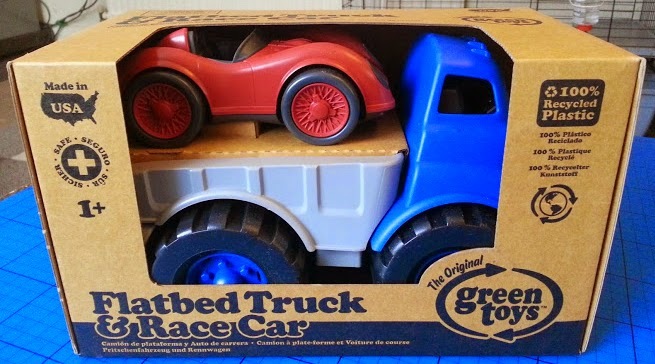 The Green Toys Recycled Plastic Flatbed Truck & Race Car currently retails at £25.99, which seems a lot until you realise you can buy it for a first birthday and it will genuinely last a child (or several children) for 5 years play. 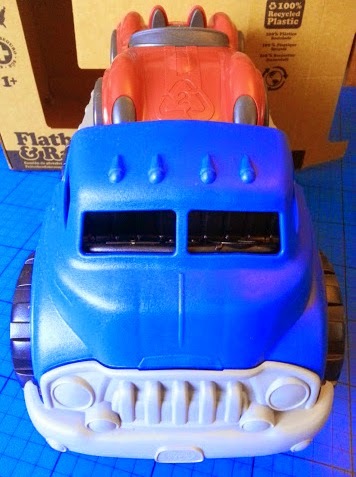 Over the years I have bought far more trucks than I'd ever care to count, and I have very few items left from when my oldest was little 21 years ago. The Green Toys products will all still be in my toy box, in great condition, in 20 years time when my Grandchildren come round to play. 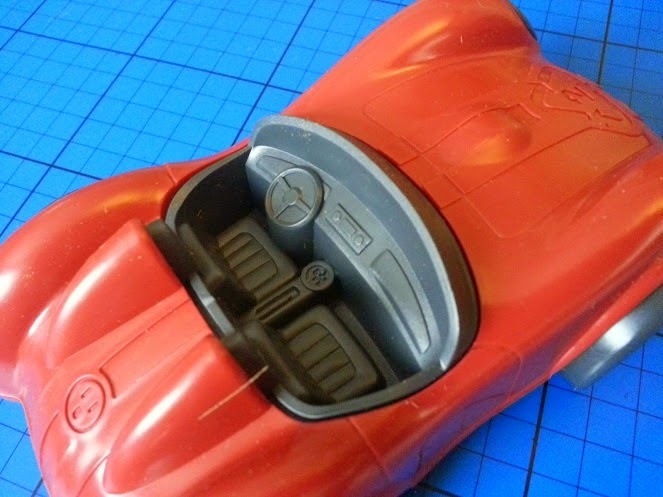 All reviews are shown on my Toy Review Page, or by searching Green Toys in the search box at the top right of the page. We were sent our Flatbed Truck With Race Car to review. I actually love the 1950's styled DHL vans myself. What a wonderful idea. These would make a fabulous special present for someone - and I love the idea that they've made a real effort with the packaging, too. They look such a great quality toy. Im sure you will keep it for years! Looks like another winner from Green Toys, love the shape of the car.